North American Aviation XB-70 Valkyrie je bil prototip ameriškega strateškega bombnika, ki naj bi postal B-70. Načrtovalo ga je podjetje North American Aviation v poznih 1950ih. Imel je šest motorjev in naj bi letel pri hitrosti Mach 3 na višini 21 000 metorv. Taka hitrost bi mu omogočila izogibanje lovcem prestreznikom, edino proti bombniško orožje tistega časa, ko vodljive ptoriletalske rakete še niso bile na voljo oziroma so imele omejene sposobnosti. Napredne protiletalske rakete, nove interkontinentalne balistične rakete - ICBM in visoka cena bombnika so vodile k ukinitvi programa. En prototip je bil izgubljen v zračnem trčenju z zasledovalnim letalom. Conway, Erik M. High-speed Dreams: NASA and the Technopolitics of Supersonic Transportation, 1945–1999. Baltimore: Johns Hopkins University Press, 2005. ISBN 0-8018-8067-X. Greenwood, John T. (ed). Milestones of Aviation: National Air and Space Museum. Westport, Connecticut: Hugh Lauter Levin Associates, Inc., 1995 (first published: 1989). ISBN 0-88363-661-1. Heppenheimer, T. A. "Facing the Heat Barrier: A History of Hypersonics, part 1, "part 2." NASA, NASA History Series, 2006. Retrieved: 6 April 2009. Jenkins, Dennis R. and Tony R. Landis. North American XB-70A Valkyrie WarbirdTech Volume 34. North Branch, Minnesota: Specialty Press, 2002. ISBN 1-58007-056-6. Lang, Walt N. United States Military Almanac. New York: Random House, 1989. ISBN 0-517-16092-7. Knaack, Marcelle Size (1988). Post-World War II bombers, 1945-1973. Washington, DC: Office of Air Force History. ISBN 0-16-002260-6. Koenig, William and Peter Scofield. Soviet Military Power. London: Arms and Armour Press, 1983. ISBN 978-0-85368-592-0. Machat, Mike. 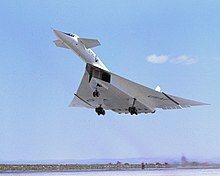 "XB-70 Valkyrie: Rollout and First Flights, May 1964 – June 1966." Wings Volume 35, No. 8, August 2005. Miller, Jay. Convair B-58 Hustler (Aerograph 4). Tulsa, Oklahoma: Aerofax, 1985. ISBN 978-0-942548-26-6. Moon, Howard. Soviet SST: The Techno-Politics Of The Tupolev-144. Westminster, Maryland: Orion Books, 1989. ISBN 978-0-517-56601-5. Pedlow, Gregory W. and Donald E. Welzenbach. "Chapter 6: The U-2's Intended Successor: Project Oxcart, 1956–1968." The Central Intelligence Agency and Overhead Reconnaissance: The U-2 and OXCART Programs, 1954–1974. Washington, D.C.: Central Intelligence Agency, 1992. No ISBN. Pace, Steve. North American XB-70 Valkyrie, second edition. Blue Ridge Summit, Pennsylvania: TAB Books, 1990. ISBN 0-8306-8620-7. Rees, Ed. "The Furor Over Fantastic Plane." Life, 17 October 1960, pp. 125–126. Taube, L.J., Study Manager. "SD 72-SH-0003, B-70 Aircraft Study Final Report, Vol. I." North American Rockwell via NASA, April 1972: Vol. II: Vol. III: Vol. IV. Winchester, Jim. "North American XB-70 Valkyrie". Concept Aircraft: Prototypes, X-Planes and Experimental Aircraft. Kent, UK: Grange Books plc., 2005. ISBN 978-1-84013-809-2. York, Herbert Jr. Race to Oblivion: A Participant's View of the Arms Race. New York: Simon & Schuster, 1978. ISBN 0-06-181898-4. Čas zadnje spremembe strani: 20:46, 13. november 2017.